The Yosemite Valley Visitor’s Center is frequented by many a mom and dad at the start of their pursuit of the great outdoors. It’s a great place to begin with plenty of maps and advice to go around. “If you aren’t an experienced camping/hiking/walking the trails family, you should stop in at the visitor’s center. 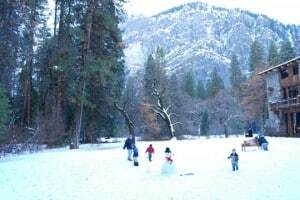 You’ll find maps and hopefully a park employee to answer any questions,” says familiarycerz. Besides gaining your bearings, the Visitor’s Center offers other educational activities for kids. Trekaroo mom arial confirms that this is a great way to start your child’s Yosemite adventure: “Not only can you learn about the surroundings and environment, but you can also watch a great free video that is full of history.” With so much to see and do, first time visitors will especially benefit from the resources at the Visitor’s Center and find the most enjoyable way to explore. It’s on the postcards and in the films, but there’s nothing quite like watching massive amounts of water fall a few thousand feet. It’s quite a step up from the bathtub faucet. Trekaroo parent doubleadventure reminds us that this aquatic wonder truly is for everyone, “Even the tiniest munchkins and those who are disabled can get up close and personal with the Lower Falls”. Many a youngster (including this author at the ripe age of 7) has made the trek up this towering fall. 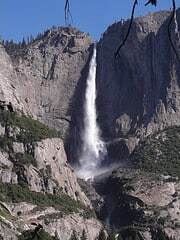 Trekaroo user Arial also waxes nostalgic about her childhood journeys up the Falls and gives the recommendation of packing a good hearty lunch for the trek. 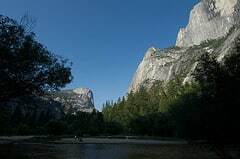 Whatever level of physical exertion you choose, the kids will no doubt be awed by the sight and sound of the three falls the make up this beautiful trademark of Yosemite. In Mariposa Grove the trees are nearly as tall as your child’s imagination. “There are amazing trees here, really big ones, that you can walk through,” says morrobaykim about this precious forest. 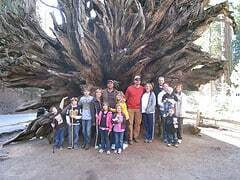 HDinSoCal enjoyed the walk to “Grizzly Tree” with the family, “This tree was the best tree worth seeing.” Amongst these cousins of the Redwoods, there are many ways to meander through the towering, millenniums-old trees by foot or by guided tour, whichever suits your motion fancy. Trekaroo parents warn, however, that the parking lot is frequently full, especially in the summer. 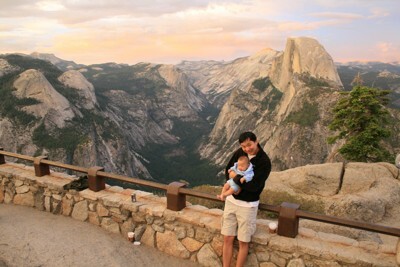 Trekaroo is seeking families who love National Parks! Sign in and share your reviews on Trekaroo. Every review you write over the next 3 weeks can be can be entered in the $1000 Summer of Travel Contest!. Stephen Wanta is a contributing author on Trekaroo – a reviews site dedicated to exploring and traveling with kids.